Do you have Thanksgiving traditions? Maybe you gather at the same place each year. Maybe you make the same food every year. Maybe you watch the parade with your family while still in your pajamas. Whatever it is, I love traditions. I always wonder if I’m doing a great job of creating those traditions that turn into long last memories for my girls. I’m thinking that the parade watching in the jammies is going to be our tradition. I’m all about lounging around and relaxing in the morning when we don’t have to rush to work. Obviously jammies are a must in this routine. Miss K loved the parade last year and I’m hoping she does again this year! We live in the town we both grew up in so we are surrounded by family and friends every holiday. It warms my heart knowing we are never lacking places to go and people to see. We typically go to my side’s Thanksgiving celebration and I think it’s funny that we have fallen into a routine as far as the food goes for Thanksgiving. We each have our little “specialty” and we just sort of agree on what we will bring every year. This year I’m in charge of the dessert for Thanksgiving. Obviously we will have the traditional pumpkin pie but I’m all about variety in my life so we need more than one dessert! 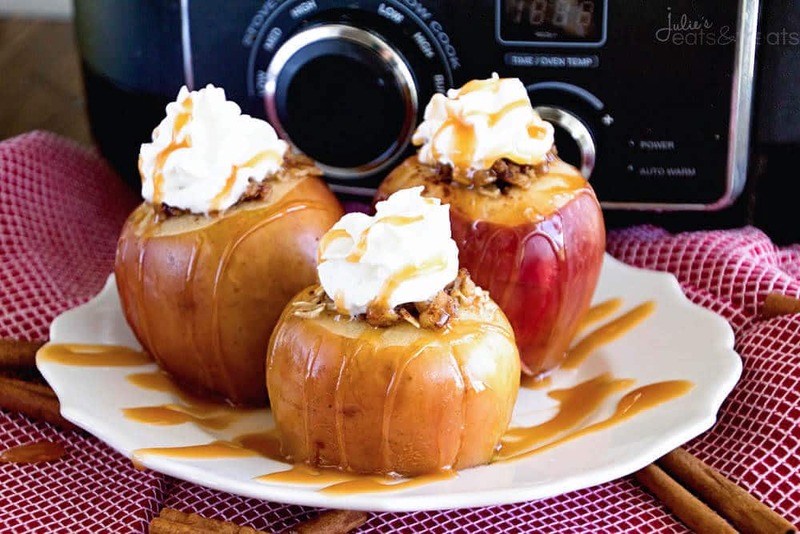 I assure you that these delicious Light Crock Pot Baked Apples with also be making an appearance at Thanksgiving! Before this I had never tried a baked apple. As my friend said, “Are they really good? They kind of look like mush.” Ummmm, so totally not the case. They are amazing. To die for. Deliciousness. It’s pretty much like a lighter version of apple crisp. 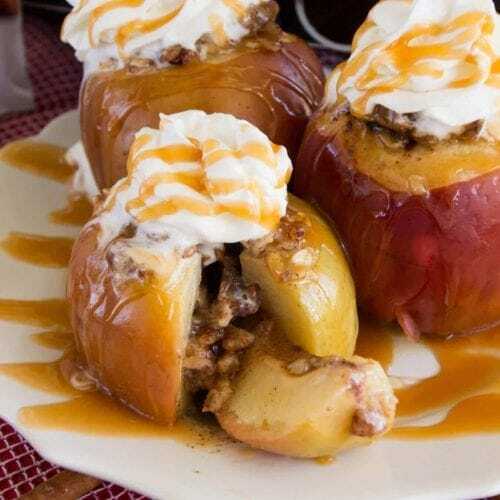 An apple crisp you kind of turned inside out! 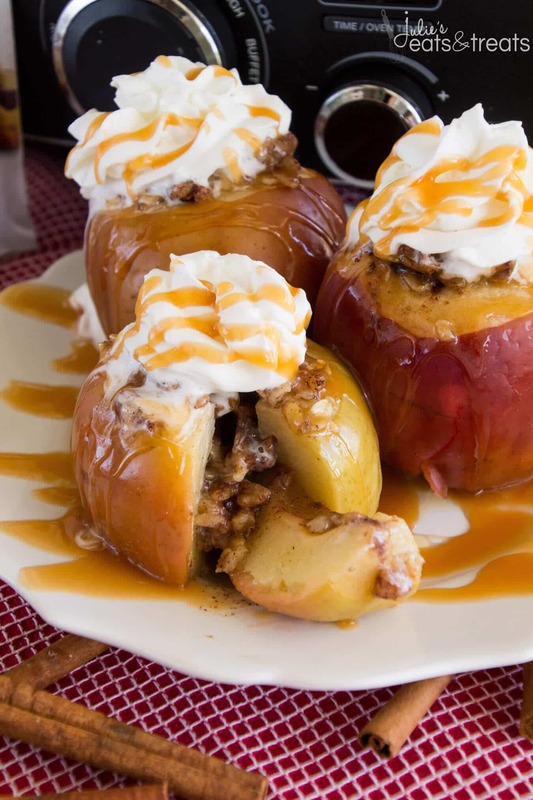 The apple are slow cooked to perfection and stuffed with an oat mixture that is just the right amount of sweetness. 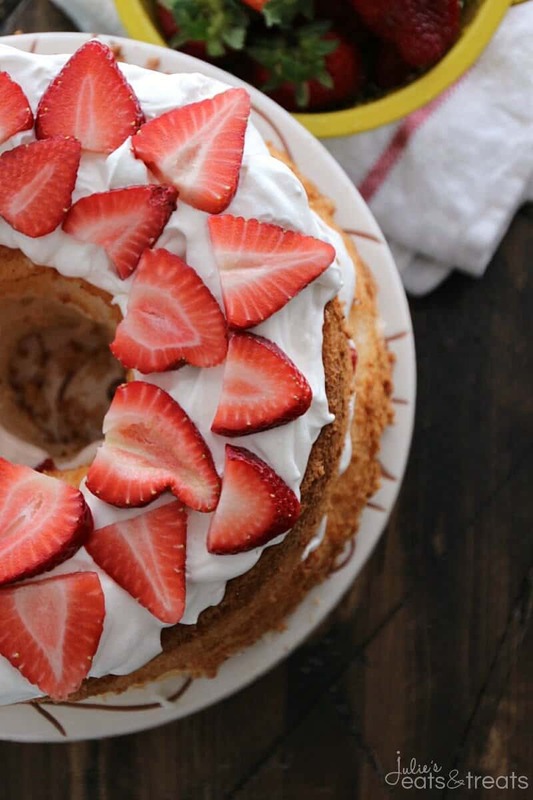 Dollop a little whip cream on them and drizzle them with caramel and you have a home run! I’ll let you in on a little secret. This melon baller makes the apples super easy to core! This dessert is part of a virtual “Friendsgiving”! Dinner was kicked off with this delicious Baked Brie with Roasted Balsamic Cranberries appetizer from The Wicked Noodle. Yummy Healthy Easy followed with this delicious Brown Sugar Glazed Ham and I topped it off with these Light Crock Pot Baked Apple for dessert! All these recipes were made with Truvia product and all perfect for your Thanksgiving or Friendsgiving feasts! In a mixing bowl combine Truvia Brown Sugar Blend, walnuts, butter, oats and cinnamon. Core the apples by using a melon baller to remove the core. You want to make sure to leave about 1/2 inch apple at the bottom of the apple so your filling stays in the apple. Fill the apples with the granola filling. Pour the apple juice into the crock pot. Place the filled apples in the crock pot. Cook apples on high for 2 1/2 - 3 hours or until the apples are soft and cooked through. Remove from crock pot, top with whipped topping and drizzle with caramel. 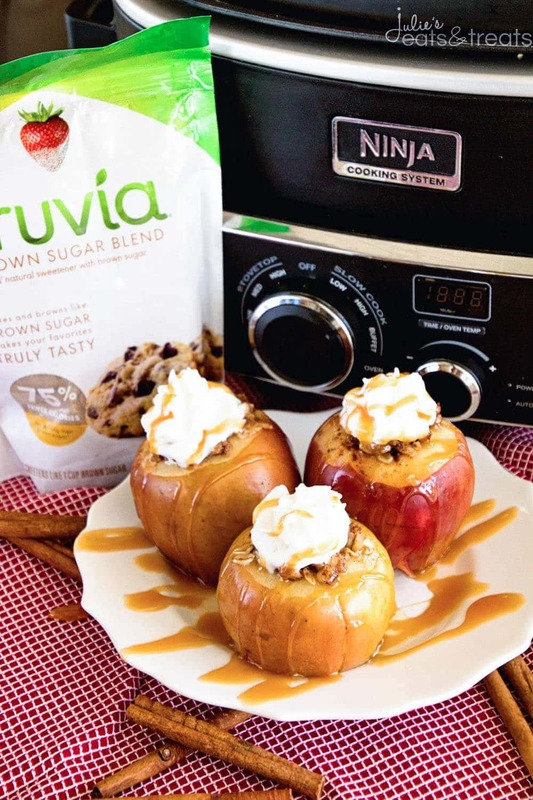 More Fabulous Recipes with Truvia! 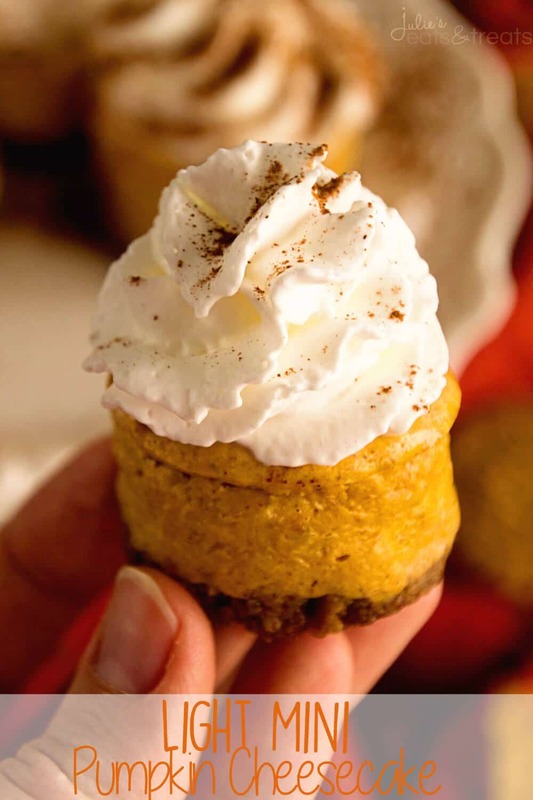 Light Mini Pumpkin Cheesecake Recipe ~ Creamy Pumpkin Cheesecake on top of a Gingersnap Crust! 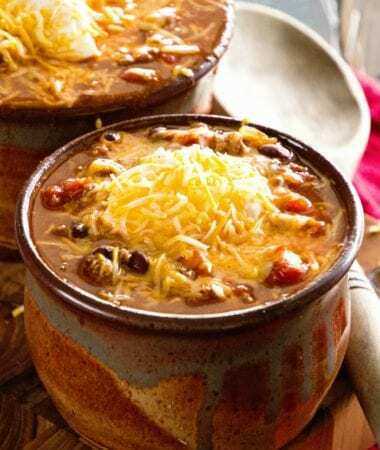 Light, Delicious and Easy! Light Crock Pot Applesauce Recipe ~ Delicious, Easy Applesauce that is slow cooked! Loaded with all the flavors of fall! I love baked apples, and especially the crumb filling/topping. And I love that yours is lighter. This looks incredible!! Shouldn’t step 1 of your baked apples include the oats as an ingredient to mix with the butter etc. Yes! It’s been corrected. Thanks for drawing my attention to that!